For anyone familiar with the 2S or 3 models, you’ll know Uuni to be a brand name synonymous with high quality and affordability (not to mention great pizzas every time). If you haven’t heard of them, prepare to read about why Uuni’s ovens are some of our favourites – and why the Uuni Pro Pizza Oven has got us particularly excited. 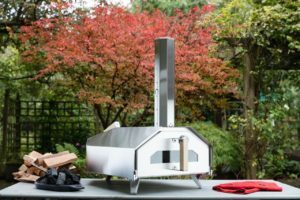 Meet the first quad fuelled pizza oven, designed to run on wood, charcoal, and with the addition of the extra burner units – pellets or gas. 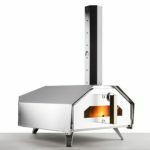 This outdoor pizza oven has many great features, the first being that it only takes 15 minutes to reach an incredible 500 degrees Celsius and only 60 seconds to cook the perfect pizza. It is made of 430 stainless steel, has a ‘tripod’ leg design and is completely insulated with ceramic fibre. Because it is reasonably portable, it also has a ‘security loop’ – a unique feature which allows it to be secured to other garden furniture or a surface. This is also useful for protecting against unwanted movement (if you’re hosting a garden party then the occasional knock by a guest is inevitable!). Due to its multi-fuel capabilities and large cooking surface area the Uuni Pro outdoor pizza oven is extremely versatile meaning you can prepare and cook many other foods such as bread, roast meats, fish – the list goes on. It’s perfect for personal use and with its sleek design would make a fabulous addition to anyone’s garden. The quick cooking time also means it’s perfect for parties or catering for a large number of guests. As standard, you’ll get the wood and charcoal burning units with the oven. Guidelines recommend using charcoal to maintain a baseline heat, then throwing in the wood just prior to cooking a pizza for tasty results. At the time of writing, the gas unit can be supplied to all customers within the UK and Germany at a cost of under £50. 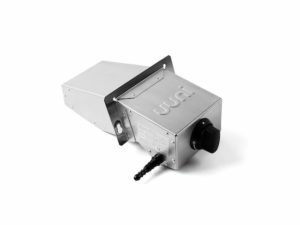 This works with conventional outdoor bbq gas canisters, and the unit itself has a dial which regulates the gas flow, allowing for accurate temperature control. The slightly cheaper pellet burner has a price tag of under £40 – a bargain when you consider the extra versatility. Two doors are supplied – one glass door with a thermometer, and the other with a ‘letterbox’ style opening – the latter being for use with the gas unit. Both doors are easily openable and removable using the supplied Allen key. You’ll also receive a user manual (to help with the simple assembly and basic use) and a pair of safety gloves. Extra accessories in the range include a cover, peels, various casserole / sizzler pans and an infra-red thermometer. The setup measures L 29.13″ x W 19.29″ x H 31.1″ and weighs in at 26kg meaning it is relatively portable and can easily be loaded into a car or van for transportation. Also take note of the large cooking surface (45cm x 45cm) which is twice the size of the Uuni 2 & Uuni 3 (17.7 x 17.7″) and allows for authentic pizzas up to 16″. One of the things we really love about the Pro oven is the selection of extra accessories available to purchase – with these add-ons you can do almost anything with your burner, and Uuni have clearly put a lot of effort and research into making this the best oven in it’s class.